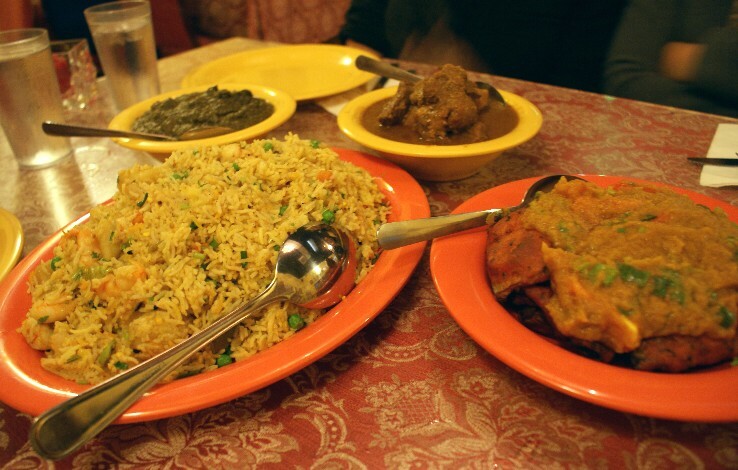 For this month’s girls dinner we took a walk on the exotic side for some Indian cuisine at Cafe Taj Mahal. I adore Indian food, but not all my friends and family are as into it. You might also say Indian food is a minority as far as dining out in Honolulu, so it was such a treat to discover a new restaurant and enjoy good Indian food at the same time. 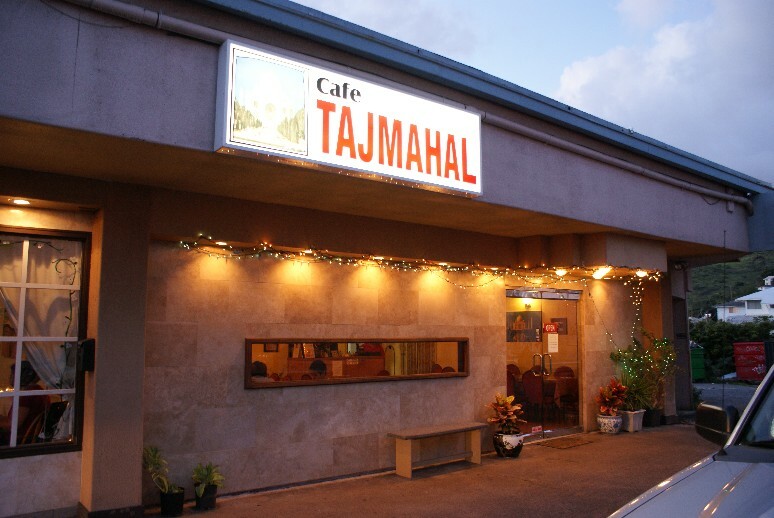 Cafe Taj Mahal is located next to Sabrina’s Italian Ristorante on the corner of Waialae Avenue and St. Louis Drive. Parking is difficult, but there’s ample additional parking at the paid public lot across the street. 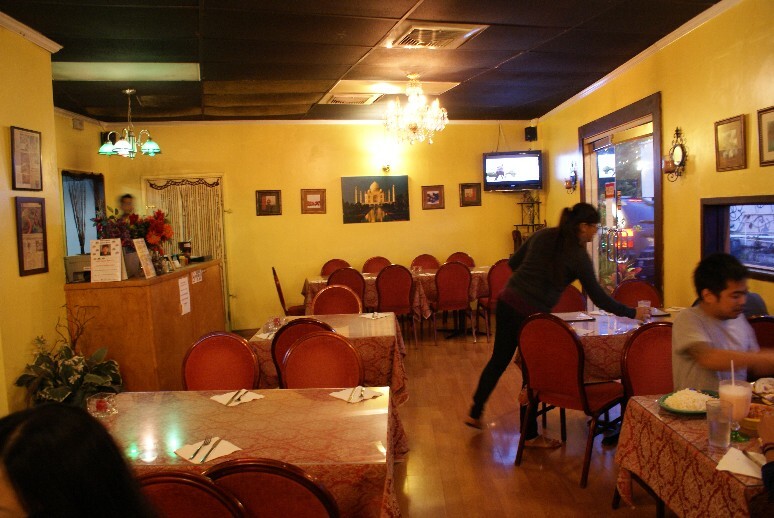 Once inside, the restaurant is cozy, neat and friendly. 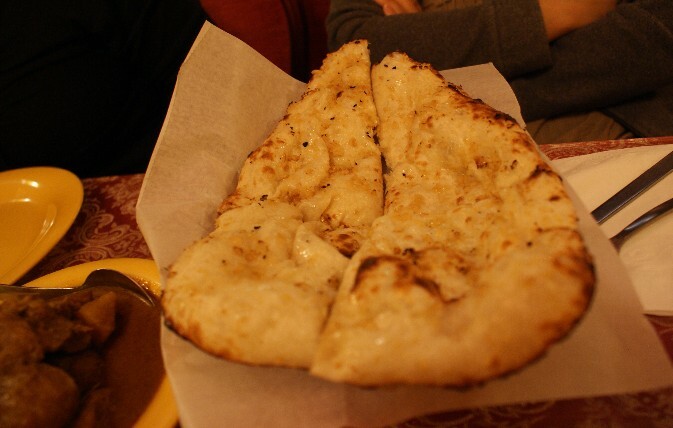 We shared freshly baked Garlic Naan ($3.99). Naan bread is so heavenly – it’s chewy and fluffy and steamy all at the same time. It’s a must-have when dining Indian. Shrimp Biryani ($16.99) – HUGE portion, similar to a shrimp fried rice but with a hint of curry spice and assorted vegetables and potatoes. Palak Paneer ($11.99) – a mild creamed spinach and cheese curry. One of my all-time favorite dishes. Lamb Curry Masala ($15.50) – curry with tender chunks of lamb meat. Eggplant Tikka Masala ($11.99) – deep-fried pieces of eggplant served with a mild tomato based sauce. and not pictured, Rice Polau ($5.50) – generous portion of basmati rice simply flavored with ghee (clarified butter) and herbs. I must have rice with my curry, so this was the perfect accompaniment. It was such a wonderful dinner and I think we all left feeling very satisfied. Of course we continued on to part two of our get together: Starbucks and more conversation. Till next month! I LOVE Indian food! Somehow, I rarely have the opportunity to eat it in Hawaii, so this was another one on my list of must-eats in Japan. Indian food in Japan? Actually, there are a few good authentic Indian restaurants in this area. We went to lunch at a place called Sania, named after the Indian owner’s daughter. The Indian gentleman who served us barely spoke Japanese, so it was funny to watch him bow and say “arigatou gozaimasu” and “sumimasen”. The restaurant was doing pretty well, thanks to the 1000 yen lunch buffet special. I ordered a set menu (1990 yen) that includes 3 curries of my choice (Chicken Curry, Palak Panir, and Vegetable Egg) and comes with Naan, Saffron Butter Rice, Salad, Sikh Kabab, Chicken Tikka, and a cup of Chai. Everything was so delicious. I’m in awe of the variety of spice blends used in Indian food, making each curry uniquely different. Another great meal.